It's said the Damascus-based Jaish al-Islam claimed responsibility, but also called it a crime by a lone commander, who would be punished. 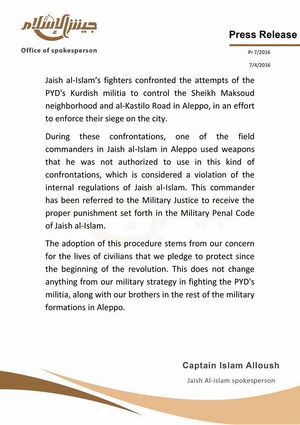 Purported statement, inset at right: Jaish al-Islam arrest commander for using unauthorized weapons in attack on Sheikh Maqsood in Aleppo source. Where he was supposed to fire the chemical weapons might be of interest to some. This is a subject ACLOS can and will consider, in time, but it's a slow start. This page was last edited on 4 July 2016, at 13:20.